Have you noticed? Vegan yogurt is going through a period of revival. Let's call it a dairy-free yogurt renaissance. Right now you can find creative, delicious, dreamy plant-based yogurts using almond, coconut and soy ingredients. Unlike when I first went vegan, over ten years ago, today's vegan yogurts are versatile, creamy, silky, sweet and satisfying. I spent the past week taste testing all the brands and flavors I could get my hands on. 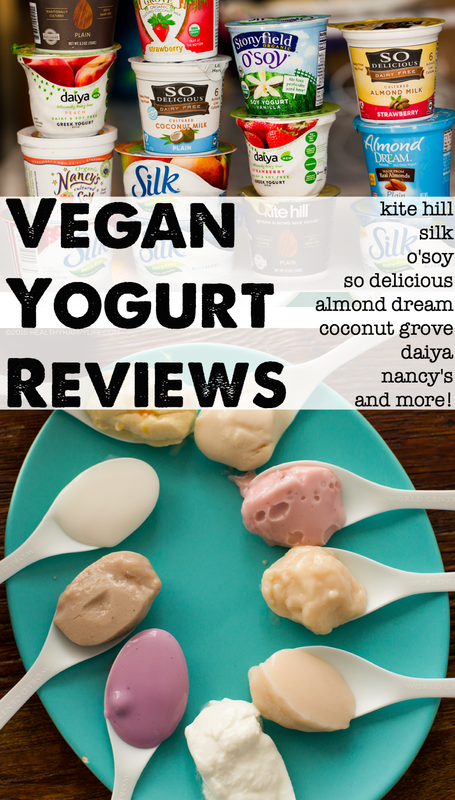 So take a peek at my vegan yogurt reviews + buying guide. Fall in love with yogurt again.. Pop those tops and lets get tasting. I have always loved yogurt. In my pre-vegan days I would stack my fridge shelves with rows of dairy yogurts. 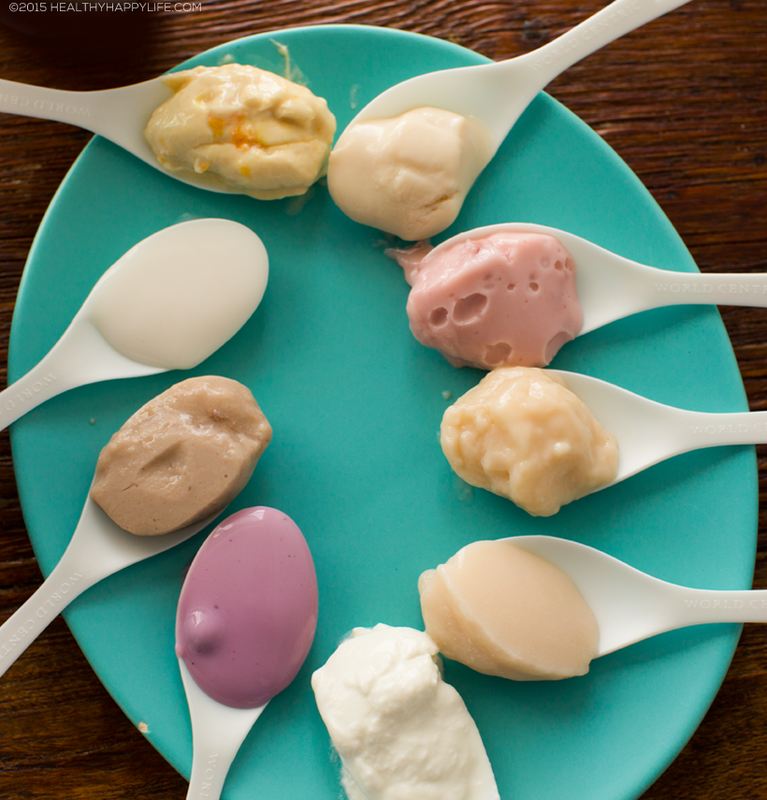 From thick, gelatinous custard-style strawberry to fat-free 'Boston Cream Pie' and 'Key Lime Pie' flavors to sweet, creamy vanilla and swirled lemon and blueberry. I would bring yogurt for school snacks, eat it for breakfast with crunchy granola and fruit, swirl it into smoothies and grab it as a late night snack. Yogurt, it turns out, was a pretty solid comfort food for me. But when I went vegan, I noticed that dairy-free yogurts didn't exactly have their game together. They didn't have the flavor and variety range compared to my dairy yogurt besties, and the texture was a bit, well, off. 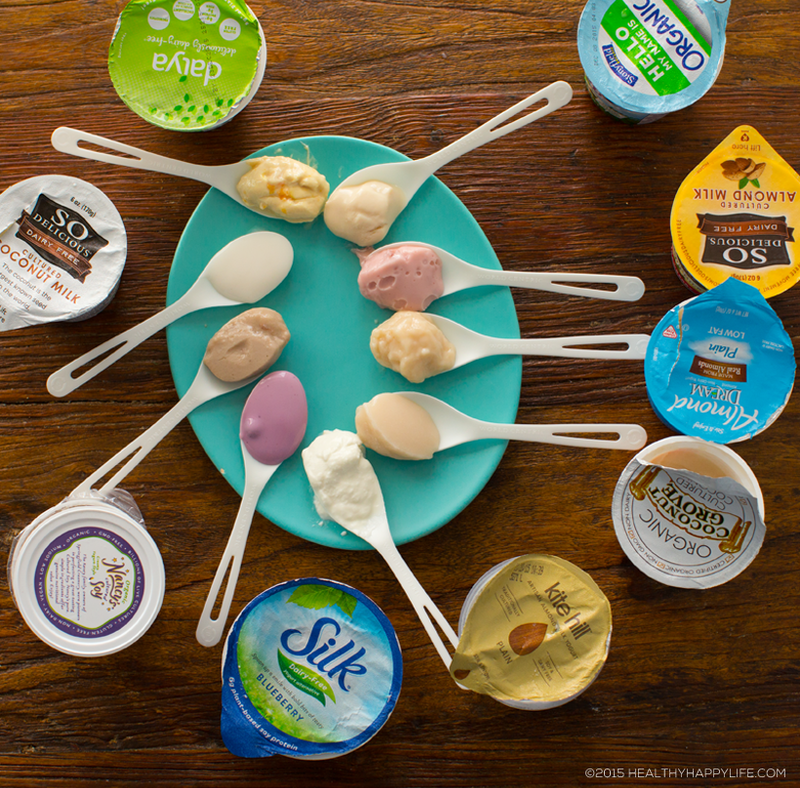 Eventually, after years of ditching dairy-free yogurts, I found a few options I liked. A brand called Whole Soy and Co (which recently closed down) nailed the vegan yogurt thing. And Trader Joe's soon had a few ok options in peach and strawberry flavors. But recently, vegan yogurt options have multiplied. And my taste buds couldn't be happier. This past week as I LOADED my fridge with every vegan yogurt brand and flavor imaginable (and available at my local grocery stores). I nibbled different flavors, did back-to-back taste tests and over all made my gut bacteria very very happy in the process. Yogurt overload! But it turns out, with yogurt, I don't think you can get too much of a good thing. 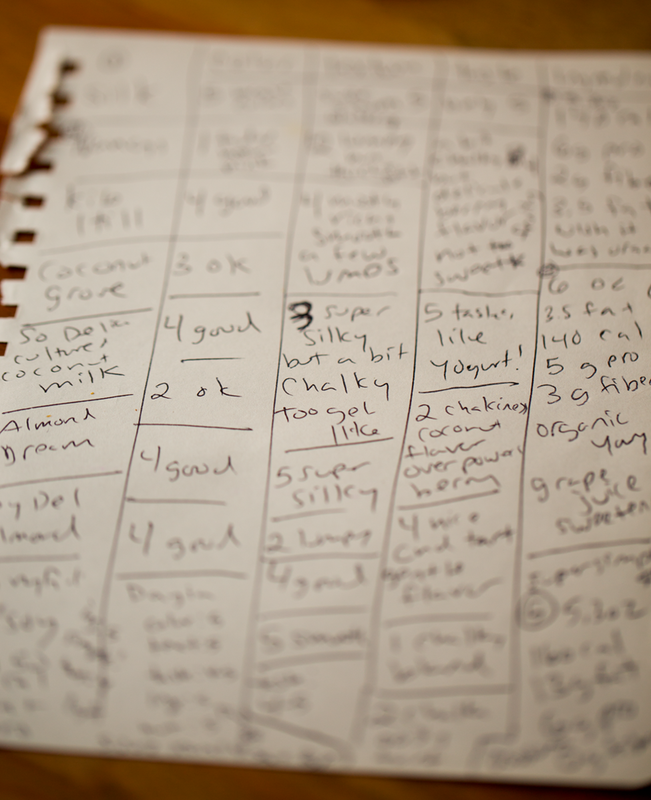 I loved adding one, two or even three yogurts to my day of food! And the reviewing began with scribbles of notes and tests and re-tests. Not a bad gig to take on. My results are in! Get your yogurt spoons ready..
- Sweetness. If you do not like yogurts that are overly sweet, or you like adding your own sweeteners and flavors (like maple syrup, cinnamon and more) choose plain or unsweetened varieties. - Fresh is Best. Always look for the latest "sell by" date. You may need to dig in the back of the row to find one. - Fruity and Fun. For a sweet treat yogurt, look for fruity and dessert flavors like strawberry, blueberry and even chocolate. 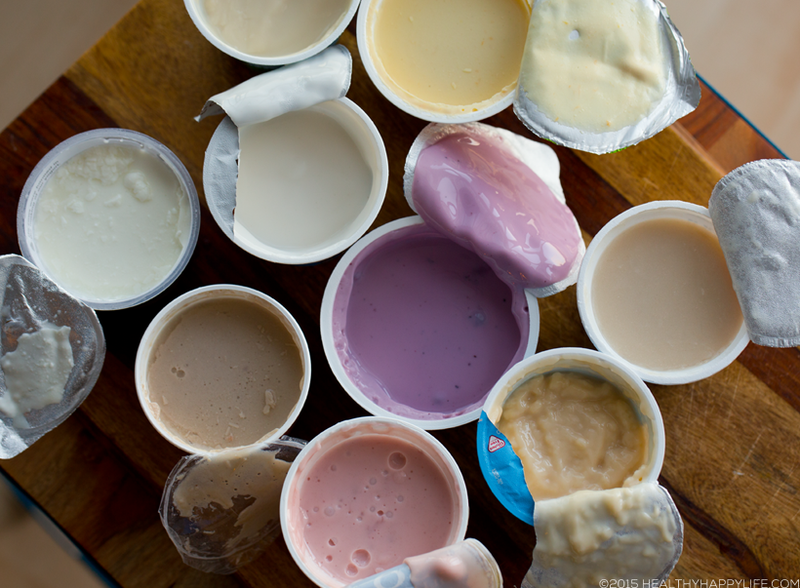 - DIY Yogurt Flavors. 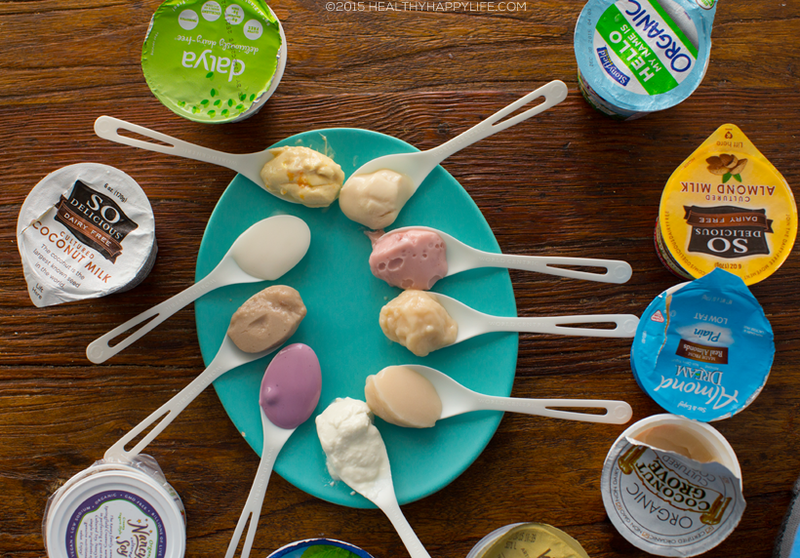 It is easy to create your own DIY customized yogurt flavors at home. Just buy a plain or vanilla flavored yogurt and use these ingredients to create your own DIY yogurt flavors: cocoa powder, maple syrup, almond butter, cinnamon, fruit jams, superfoods like hemp and chia, granola and on and on. - Smoothies + "Frozen Yogurt" Vegan yogurt is a great substitute for non-dairy milk when making vegan smoothies or "banana ice cream." Your smoothie or ice cream will turn out thicker in consistency using yogurt, so add water or non-dairy milk as desired to thin things out. - Probiotics. Vegan yogurt is a source of probiotics. You may also be getting protein, fiber and healthy fats --depending on what brand you buy. - Coconut-based yogurts tend to have a silky and rich texture, and are higher in fat than soy or almond yogurts. Coconut yogurt usually does not contain as much protein, but does often include a nice boost of fiber. 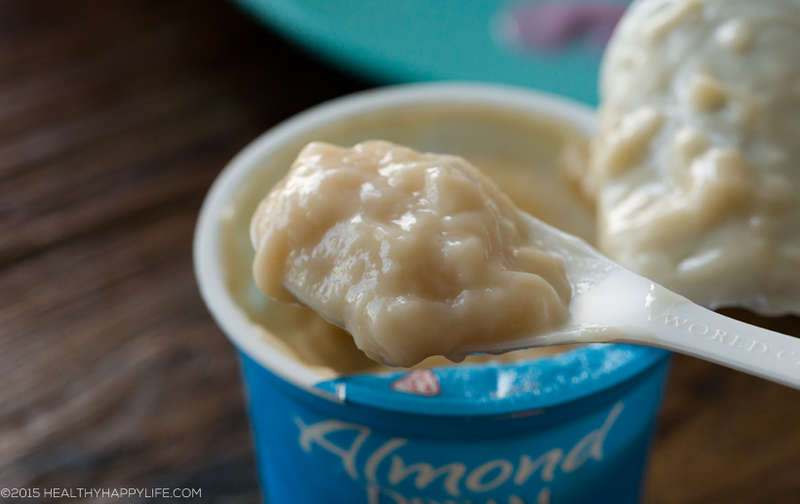 - Almond-based yogurts tend to be lower in calories and have a thin or "light" texture. They are usually not rich in protein or fiber. However, Kite Hill is an exception to this rule, and is rich in healthy fats. I can assume that the reason for how much fat is in an almond-based yogurt (since almonds are rich in healthy fats as we all know) has to do with how "watered down" the almond base is. This can be very true for almond milks as well. - Soy-based yogurts tend to have creamy, fluffy texture as well as a nice boost of protein from the legume base. Soy yogurts, like soy milk, for me, tend to mimic dairy the most effectively. Soy yogurts usually contain a bit of fat and fiber, but not much. 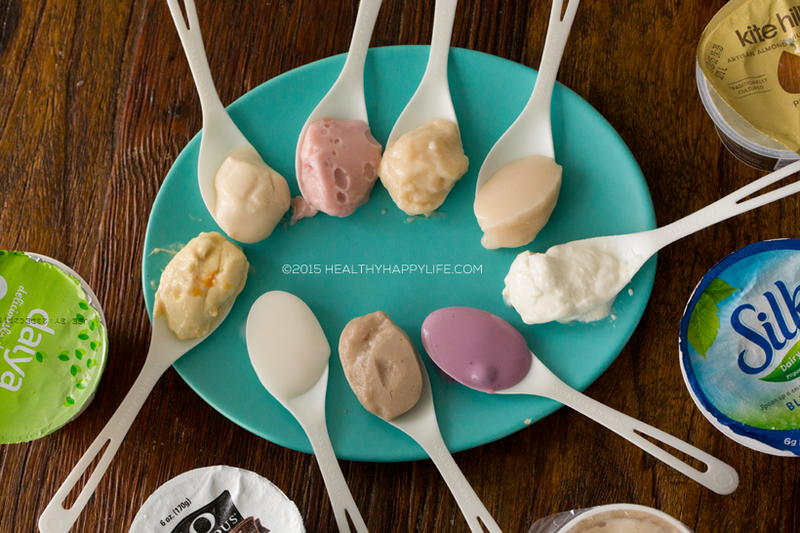 BioKPlus Soy or Rice based yogurt shots! I did not include this brand in my formal review because it is more or a probiotic supplement than a yogurt snack - but it is incredibly rich in probiotics and I LOVE adding them to my diet once in a while. You can find them in the Whole Foods Supplements fridge. 1. 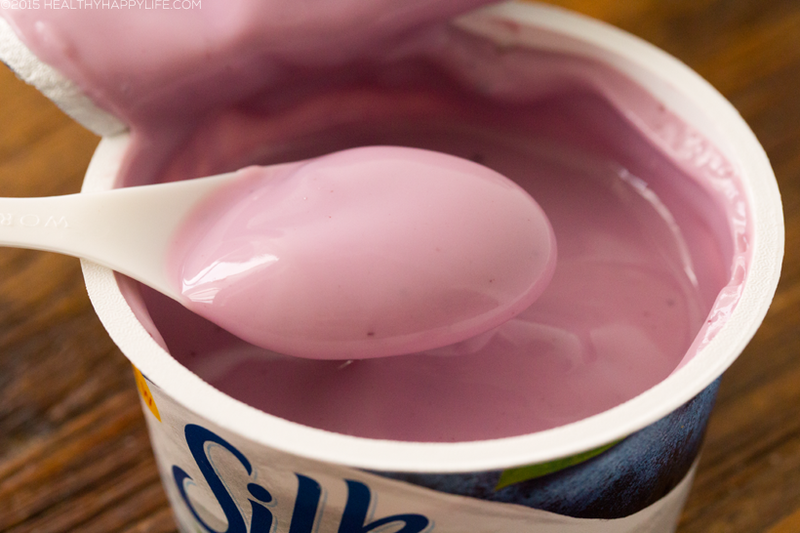 Brand: Silk "Dairy Free Yogurt Alternative"
Texture: Silky smooth, on the thin side. Taste: No chalky aftertaste, bold and pure fruit flavors. Sweet and enjoyably tart but not too sweet. Ingredients: (strawberry) Soymilk (Filtered Water, Soybeans), Cane Sugar, Strawberries, Contains 2% or less of: Corn Starch, Natural Flavor, Pectin, Strawberry Juice Concentrate, Tricalcium Phosphate, Lemon Juice Concentrate, Citric Acid, Dipotassium Phosphate, Sea Salt, Beta Carotene (Color), Live and Active Cultures, Vitamin D2, Vitamin C Ester, Natural Mixed Tocopherols. Contains Soy. Other Notes: I love the packaging, I can add crunchy topping right in the container -- I love the fluffy silky texture, so good! Glad Silk is NON-GMO. I love the serving size at 5.3 oz instead of 6oz which is more standard. My Wishes: I wish it was organic. I wish they did a plain/unsweetened flavor. 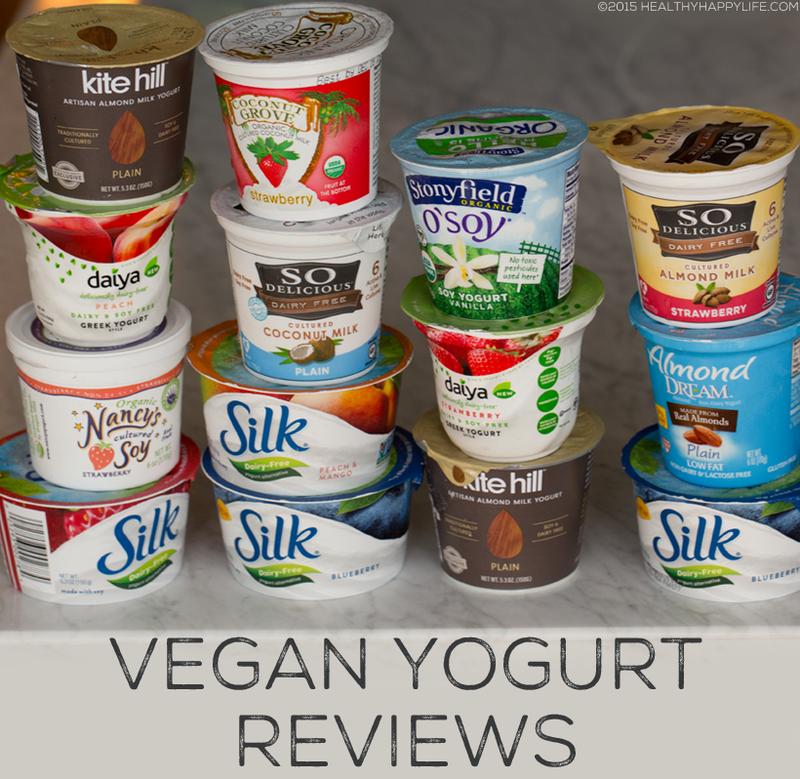 UPDATED: I am not too happy with the fact that Silk does not certify that their yogurt is vegan. And after several email exchanges they would not tell me exact details about what that means. The yogury is dairy free and vegetarian, but there is a 'certified vegan' issue with one or some of their suppliers. Again, I do not have details, but you can read some of the email exchange at the bottom of this post. Bottom Line: Tastes yummy and like a healthy treat. Vegan Company: Yes -- but the yogurt as of right now (Nov 2015) is not certified "vegan"
Color: Good and clean colors - love that the vanilla has tiny black vanilla bean specks and the fruit colors look natural. Texture: Silky yet has body and super creamy and rich - a few large lumps in the plain, but nothing unpleasant. Flavored versions are rich and silky smooth. Taste: This stuff is the real deal -- tastes like yogurt and not too sweet. I really love that you can actually taste the almond part of the yogurt. No funny aftertaste. Just pure goodness. High quality taste. Love. After finally trying all the flavors I am in love with each one. Ingredients: (plain) Almond Milk (Water, Almonds), Cane Sugar, Locust Bean Gum, Xanthan Gum, Agar, Live Active Cultures: S.Thermophilus, L.Bulgaricus, L.Acidophilus and Bifidobacteria. Other Notes: I adore the richness to this yogurt. This is the only almond based yogurt I would buy again. 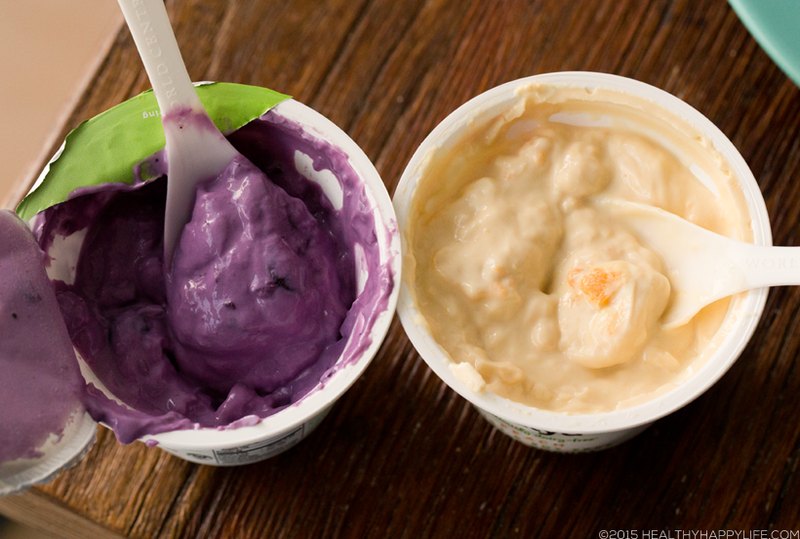 The plain flavor is the perfect DIY base for making your own yogurt flavors. Not too sweet, which is a common complaint with yogurts. My Wishes: I wish they would experiment with coconut or soy bases - I know the results would be incredible. I wish they were more widely available since Kite Hill product, right now, are exclusively sold at Whole Foods. Bottom Line: My favorite vegan yogurt!! 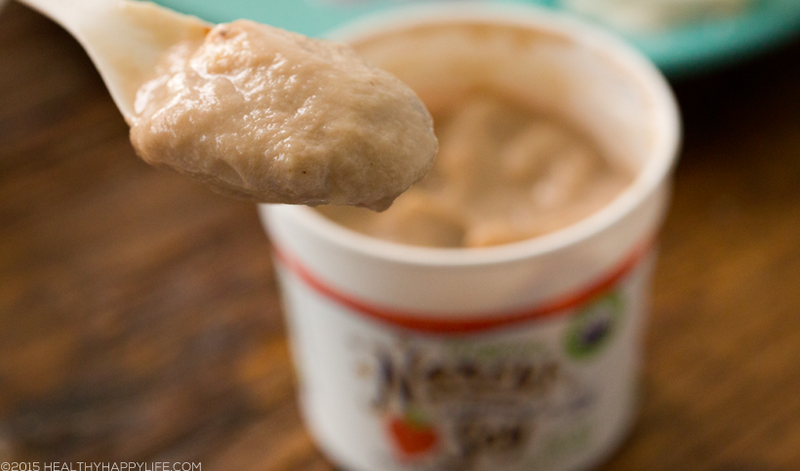 This vegan yogurt is not your mother's vegan yogurt. Even Greek dairy yogurt connoisseurs will be impressed. I love the richness! 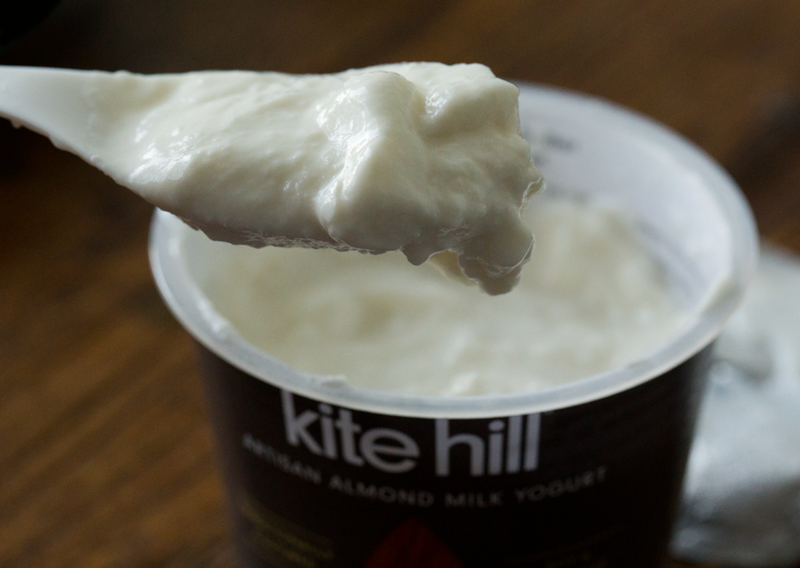 I also love the simple, high quality ingredients I have come to expect from Kite Hill products. Gourmet taste. The plain flavor is perfect for culinary uses like veganized yogurt sauces and dips. 3. 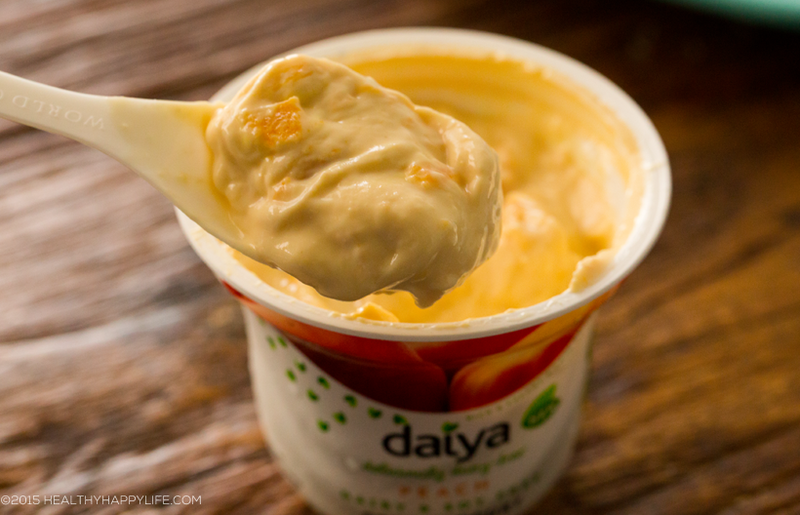 Brand: Daiya "Greek Style Yogurt"
Texture: Smooth and super thick. Custard-like. Taste: Not much tartness, but more of a rich cream + fruit flavor. Ingredients: (peach) Filtered water, peach fruit preparation (diced peaches, evaporated cane sugar, water, tapioca starch, pectin, turmeric and annatto (color), lemon juice concentrate), coconut cream, pea protein isolate, evaporated cane sugar, creamed coconut, chicory root extract, potato starch, vegan natural flavors, lactic acid (vegan), titanium dioxide, tricalcium phosphate, lemon juice concentrate, locust bean gum, pectin, guar gum, sea salt, L. plantarum, L. casei, vitamin B12. Other Notes: This yogurt is super thick. I am not used to this texture. If you do not like overly thick yogurts, this may seem too heavy for you, but since it is positioned as a "Greek style" yogurt, it works. I love the packaging and fun flavors. I love the blueberry, but the strawberry has an odd taste to me when compared side by side other strawberry brands. Not as tart and tangy as other yogurts. My Wishes: I hope they come out with a plain and vanilla flavor. And do a yogurt that is not Greek Yogurt style. Bottom Line: Successful new vegan yogurt offering that gives dairy Greek yogurt some serious competition. Color:Pure whites with the vanilla and plain. Texture: Fluffy! Silky smooth, shiny, watery yet rich. Pours on the watery side, but still has body. Taste: Smooth. I love the bright and tart flavor combined with light sweetness. Zero chalkiness, which I appreciate. 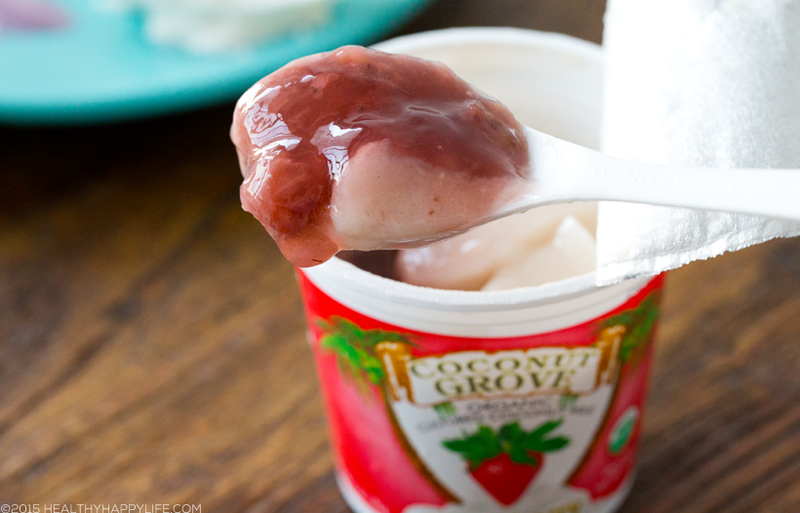 I am really into the Plain flavor lately, it reminds me of PinkBerry's vegan coconut frozen yogurt! Love the plain and unsweetened vanilla flavors a lot. Ingredients: (unsweetened plain) ORGANIC COCONUT MILK (WATER, ORGANIC COCONUT CREAM), CHICORY ROOT EXTRACT, PECTIN, ALGIN, MAGNESIUM PHOSPHATE, TRICALCIUM PHOSPHATE, RICE STARCH, LOCUST BEAN GUM, LIVE CULTURES, GUAR GUM, DIPOTASSIUM PHOSPHATE, GELLAN GUM, XANTHAN GUM, VITAMIN D2, VITAMIN B12. Other Notes: This yogurt is super smooth and I love the characteristic tart "yogurt" flavor. My Wishes: I wish there was protein in this yogurt. 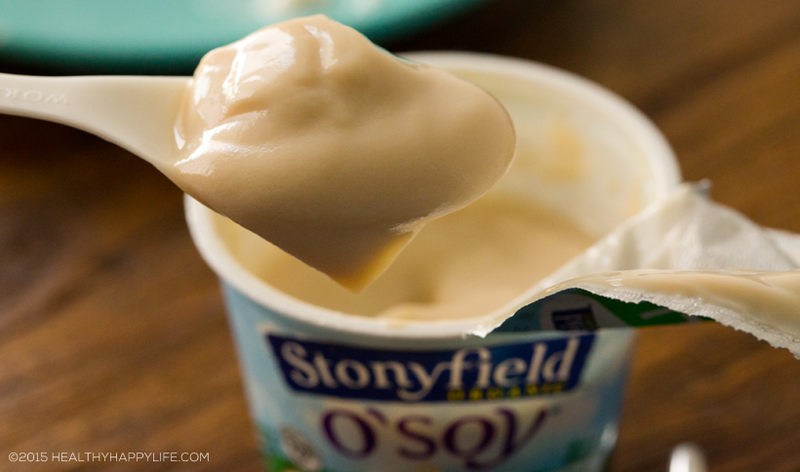 Bottom Line: Love this silky smooth, tastes-like-yogurt yogurt. Light and lovely texture. Super fluffy! Color: Muted colors because of fruit-on-bottom style. Texture: Smooth, good fruit content. 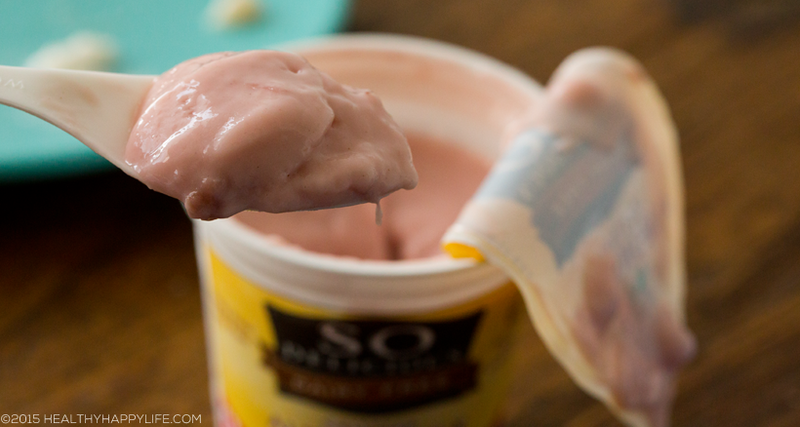 Has a classic thick and creamy yogurt texture. Taste: Pleasant sweet and tangy flavor. The vanilla is so light and appealing. Flavors taste authentic. Ingredients: (strawberry) CULTURED PASTEURIZED ORGANIC SOY MILK, ORGANIC SUGAR, ORGANIC STRAWBERRIES, NATURAL FLAVOR, PECTIN, CALCIUM CARBONATE, ORGANIC BEET JUICE CONCENTRATE (FOR COLOR). Other Notes: I tried the vanilla and loved the flavor. The strawberry was very food too, but a bit too sweet for me. Overall I was super impressed in this brand that I have not tried in a long time. Bottom Line: Loved it. Great go-to organic soy yogurt. Taste: Flavored versions are very mild in taste. The flavors are muddled as opposed to clear and bright. Nancy's yogurt tastes natural though, which is a nice thing. The plain flavor is disappointingly bitter and tart in a way where you really have to add some sweetener, toppings or flavor to it to make it taste good. I really wanted to love Nancy's, but after many attempts and taste tests it is just not my favorite. I do applaud their ingredients though. Ingredients: Organic soy milk, org. amazake (water, org. brown rice, vegan amylase enzyme), organic strawberries, organic kosher white grape juice concentrate, Vitamin C, Vitamin E, calcium carbonate, Live Probiotic Cultures: L. acidophilus, Bifidobacterium lactis, L. casei, L. rhamnosus, Live Yogurt Cultures: L. bulgaricus, S. thermophilus. Other Notes: It is hard to get past the color and texture. But I love the ingredient profile and the fact that it is fruit juice and rice sweetened. My Wishes: I wish the fruit flavors were bolder and that the texture was silkier. More fruit color would help too. Bottom Line: I really love the flavor, I appreciate the natural taste and really enjoy it despite the color and texture issues. Taste: Coconut flavor is a bit overpowering in the base (you have to like a coconut flavor accent). Flavor ir ok, but the fruit compote is too sweet for me. A bit of chalkiness. Ingredients: (strawberry) Organic coconut milk (water, organic coconut cream, guar gum), organic tapioca starch, organic arrowroot starch, organic fruit (organic dried cane syrup, organic strawberries, water, pectin, organic locust bean gum, natural flavor, vegetable juice), organic coconut sugar, and live active cultures – S. thermophilus, L. bulgaricus, L. acidophilus and bifidobacterium. Other Notes: I love that the product claims to have "just six ingredients" but that doesn't seem true when one of the ingredients (organic fruit) has a bunch of ingredients on its own. I like that coconut sugar is the sweetener. Ingredients: (vanilla) ALMOND MILK (WATER, ALMONDS), ORGANIC DRIED CANE SYRUP, CAROB BEAN GUM, PECTIN, TAPIOCA DEXTROSE, CALCIUM PHOSPHATE, CITRIC ACID, NATURAL FLAVORS, LIVE CULTURES, VITAMIN D2, VITAMIN B12. Other Notes: I wasn't impressed with this at all. I love Soy Dream soy milk so much, but this was unimpressive. My Wishes: I hope they try a soy yogurt. And maybe rethink the consistency of this almond yogurt. Bottom Line: Not my fave. 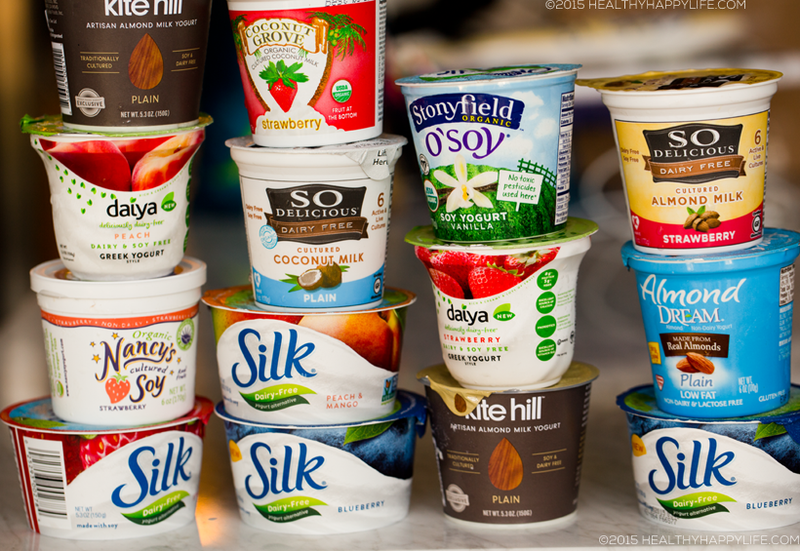 Review Details: These yogurts were all purchased by me, from Whole Foods Market. None of these reviews are sponsored. I did not taste every single flavor in these product lines, so my reviews may vary based on flavors. If you have a yogurt I missed and would like me to review, please let me know in the comments. Please also feel free to post your own reviews and comments on these brands - if they agree or disagree with my opinions. Like my reviews? Check out more!.. UPDATE: I just posted this last night and already I have some news. As you will see below, Silk is one of my faves from the taste tests. However, this morning a reader informed me of a section on Silk's website that says this: "We are currently unable to label our Dairy-Free Yogurt Alternative products as vegan due to the complex journey that some of our ingredients take on their way from the farm to the store shelf." ..I have written Silk and hope to get a response soon. I find it strange that Silk was sampling their yogurt to well known vegans at Expo West last spring (where I first tasted it) yet their website says this. I hope the have a good explanation. I am very anxious to know which ingredient is questionable. And if all vegan yogurts have this problem or just Silk? Stay tuned! Thank you for your recent email to Silk®. 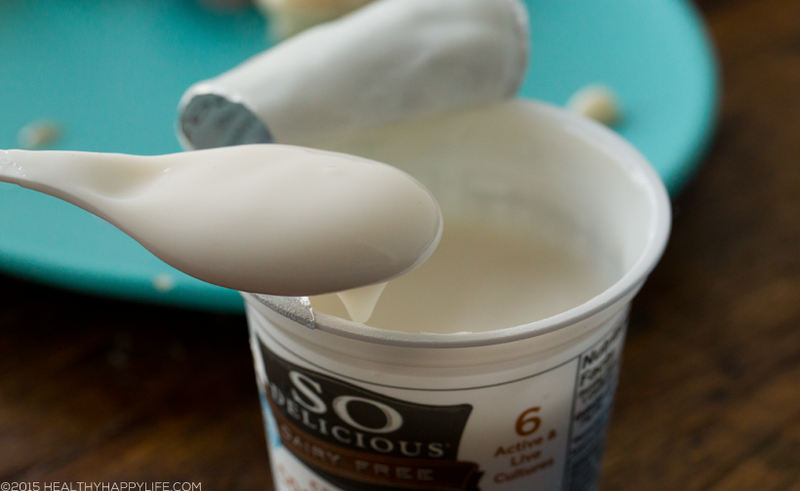 It’s wonderful to hear how you tried and enjoyed our new Dairy Free Yogurt Alternative! We worked so hard on this new product so it’s great to hear you really liked it! I am very sorry for the confusion and we appreciate your question. Due to the complex journey that some of our ingredients take on their way from the farm to the store shelf, we are currently unable to label our Silk Dairy Free Yogurt Alternative products as vegan. The product is considered vegetarian-friendly. (Vegetarian-friendly meaning no meat including beef). We source some ingredients for the Dairy-Free Yogurt from a network of suppliers and we are unable confirm that these ingredients have been processed as vegan. Thanks again for contacting the Consumer Connections Department. I hope you have a great day! ..so there you have it. I am still trying to get more details. I will update you if I do. And the next email from Silk said this..
We appreciate you following up with us. The media used to grow the live and active cultures is vegan - meaning no animal product was used. Unfortunately, there is no additional information that we are able to share beyond what you've already provided. Thanks again for contacting the Consumer Connections Department. I hope you have a wonderful weekend! 11/7/2015 -- I updated my reviews for Kite Hill, Nancy's and Silk. I finally tried all the Kite Hill flavors and love them all SO much. And I finally tried the Nancy's plain flavor and did not like it so much. But it is good when I flavor it myself. As for Silk, after several email exchanges I was very disappointed that they would not tell me exactly what the "non-vegan" item in question is in the yogurt ingredients. I did verify that it does not have to do with the live and active cultures, however. So without more transparency, I had to downgrade them from my favorite brand to just in the top flavors. Plus, Kite Hill flavored versions far exceeded my expectations. I really hope Silk can change the yogurt status to certified vegan so this issue can be put to rest. That all said, they produce a delicious product that I believe non-vegans (and vegans) will adore. More updates if I get any!